Seed Atlas of Korea includes the seed of as many as 1,500 species preserved in the KNA Seed Bank to provide better access to the data of forest seeds across the nation. The publication focuses mainly on seed morphology including seed shape, size, surface pattern, and embryo structure of each taxon. Thus, Seed Atlas of Korea can serve as significantly informative research materials to be used for getting information for identification and morphology of many plant seeds in Korea. Most of the findings in the book came out through microscopic analyses, so that the readers can see the shape and structure of tiny seeds which are nearly invisible with bare eyes, and hence enjoy the unique beauty the magnified images offer. 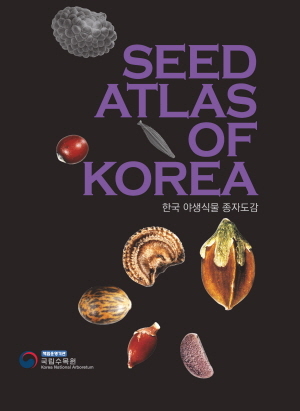 한국 야생식물 종자도감(Seed Atlas of Korea)은 한국의 산림종자데이터에 관한 접근성을 높이고자 국립수목원 종자은행에 보관중인 1,500여종의 종자를 소개한다. 본 간행물은 종자모양, 크기, 형질, 각 분류군의 배아구조 등 종자형태를 주로 소개한다. 본 종자도감은 한국 식물종자의 동정 및 형태 파악을 위한 중요한 정보가 담긴 연구자료로 활용될 수 있다. 본 도감의 연구결과는 독자들이 맨눈으로는 잘 보이지 않는 아주 작은 종자의 모양과 구조를 파악해 확대 이미지가 제공하는 종자의 독특한 아름다움을 느낄 수 있도록 현미경분석을 기반으로 한다.